The loss to Oakland drops the Steelers to 7-5-1. It’s the team’s third straight loss, but they still hold on to first place in the AFC North, with the Ravens losing earlier in the day to the Chiefs. Ben Roethlisberger missed much of the second half with a rib injury, but with the offense not moving the ball with Joshua Dobbs in there, he came back with 5:20 to play in the game. 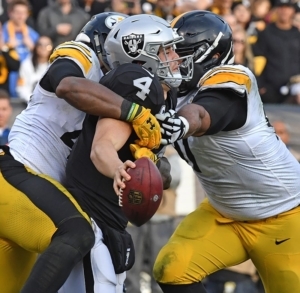 Roethlisberger drove the offense to a go-ahead touchdown and 21-17 lead, but the lead would be short lived as the Raiders came right back, regaining the lead, 24-21. Next up: Patriots come to Heinz Field for an AFC showdown.